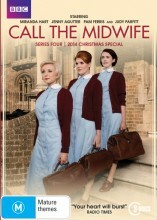 Call The Midwife series 4 DVD. The amazingly popular series based on the memoirs of Jennifer Worth set in East London in the 1950s. Inspired by the memoirs of Jennifer Worth, Call the Midwife follows the nurses, midwives and nuns from Nonnatus House convent, who visit the expectant mothers of Poplar, providing the poorest women with the best possible care. In Series 4, the community prepares to enter a new decade - the 1960s. Nurse Trixie receives a proposal from handsome young curate Tom Hereward. But tempers fray when Trixie gets carried away with everything from the engagement party to wedding presents. Nurse Cynthia starts to think seriously about joining the order as a nun, something that shocks both Trixie and Patsy. And an unexpected set of events sees Chummy take on the challenge of running a mother and baby home for unmarried girls. Elsewhere two new nurses join the team. Barbara, a vicar's daughter, is hard working and keen, but she's also inexperienced and struggles to get to grips with the demands placed on her. Nurse Crane, however, is older, wiser and a stickler for detail with lots of new ideas - not all of which meet the approval of Sister Evangelina. You'll love Call The Midwife season 4 DVD. 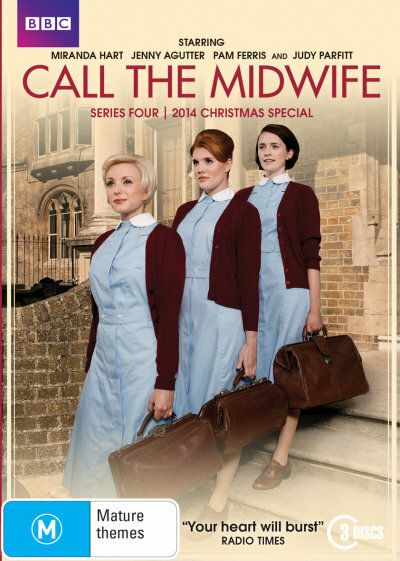 Click the button below to add the CALL THE MIDWIFE - COMPLETE SERIES 4 to your wish list.